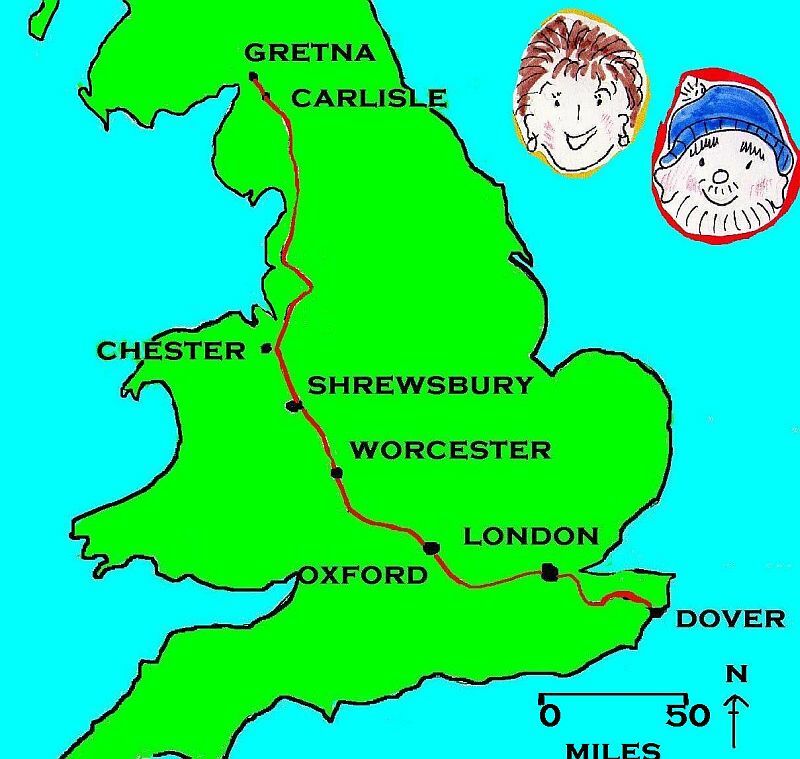 Having done the well-known Land’s End to John o’Groats and thoroughly enjoyed it (SW to NE), we have decided to walk the opposite diagonal across England, Dover to Carlisle (SE to NW). This is only half way to the NW of Scotland, and who knows, we might possibly do the remaining leg up to Cape Wrath in Scotland another time. Dover to Carlisle on this route tries to make use of existing established long distance footpaths. We will visit and worship in the Cathedrals we pass on the way as well as worshipping with local congregations on Sundays. We begin along the North Downs Way taking in the Cathedrals of Canterbury and Rochester. The next part will goes due west to the Thames Barrier, where the Thames Path will lead to Kew. This route goes through the heart of London and we shall visit the Cathedrals and Abbey (Southwark, St Paul’s, Westminster). Then we leave the Thames to follow the Grand Union Canal briefly, the Shakespeare Way and footpaths to arrive at Oxford where we shall visit Christchurch Cathedral. The route then strikes off cross-country, briefly joining the Cotswold Way at Winchcombe and continuing westwards to Tewkesbury with its Abbey. After this the route joins the Severn Way and turns north to Worcester with its Cathedral, Bridgnorth, Ironbridge and Shrewsbury with its Abbey. The Shropshire Way conveniently leads north from here and joins the Sandstone Way into Cheshire. We will visit Chester and its Cathedral. The Chester Ring Path and a variety of minor roads and canal paths lead across the Manchester Ship Canal into Lancashire. The Leeds-Liverpool Canal tow-path helps negotiate South Lancashire to the Ribble Way and Preston. The Lancaster canal leads due north all the way to Kendal. From here, paths and minor roads can be followed to Penrith. The final approach to Carlisle and its Cathedral goes beside the River Eden. Click on the Just Giving link to donate to the project. This walk is to raise funds and awareness for Christian Aid. We have pledged ourselves to raise £5000 on our walk for the Christian Aid partnership project in Afghanistan. Christian Aid. This is the same project we raised over £1200 for with the Priory900 walk. The local partner the Afghan Women’s Educational Centre (AWEC) are embarking on a three year program to help over 1,000 women and young people speak out for change in their country – through adult education, literacy training and participation in local and national decision making. The European Union has pledged to support this three year project and will provide match-funding at a ratio of 3:1. Christian Aid ask that we raise £5,000 in ‘new money’ over the next two years. With the 3:1 match-funding, this will make our £5,000 worth almost £20,000 (there is a small amount deducted for administration costs). So, in effect, every £1 we raise will be worth £4 towards the project. Before 2001 the Taliban, an extremist Islamic movement, controlled Afghanistan. Under their rule, women were denied education and employment as well as political participation and representation. Since the Taliban were deposed by the US-led invasion of 2001, a new constitution guarantees women and men equal rights – at least in theory. However, many Afghan women fear that if the Taliban are given power in any peace process, women’s rights will again be curtailed. The project will work in eight districts in three of the country’s most vulnerable provinces. Over 1,000 women and young people will benefit directly and the idea is that their experiences will then be able to benefit their local communities. Indeed, it has been calculated that the ‘cascade effect’ will reach an extra 264,378 people. Christian Aid has been working in Afghanistan for nearly 30 years. It believes that it is vital to empower women and young people; through literacy and education and community involvement; so that they can take responsibility for their own future development in the years ahead.